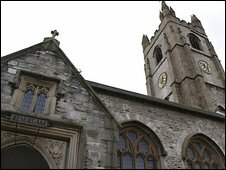 A Plymouth church which became a symbol of hope for the city when it was rebuilt after being bombed in World War II has been awarded minster status. St Andrew's Church, known locally as "the Mother Church", was given the title by the Bishop of Exeter to mark Plymouth's importance as a city. There has been a church on the site, off Royal Parade, since 1087. St Andrews' Rector said the church had a "deep place" in the hearts of many people in Plymouth. St Andrews will be the only minster in the diocese of Exeter, a title which is used describe large churches which act as a "parent" church for smaller local churches. The Right Reverend Michael Langrish, Bishop of Exeter, said: "In recognising the historic role of St. Andrew's as a place of celebration, worship and mission for the city, we are also recognising the importance of the city in the South West and its historic contribution to our national life." The church became a symbol of hope after being left a burnt-out roofless shell by a German bombing raid in 1941. Just the tower, bell, clock and walls were left standing. The next morning someone placed a wooden board over the North door with the Latin inscription "Resurgam" (meaning "I will rise again") written on it. The word is now carved in stone above one of the entrances. In 1949 the present Queen, then Princess Elizabeth, laid the foundation stone for the church's restoration and in 1957 the rebuilding was finished. Prebendary Nick McKinnel, the Rector of St Andrews, said: "It became a bit of a symbol of new life, of resurgence, and for that reason St Andrews has a deep place in the hearts of many people in this city." 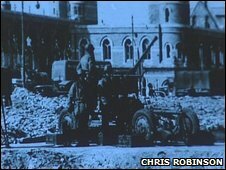 Chris Robinson, a Plymouth historian, said: "It's been at the heart of the community for a thousand years. "It's because of the role that it's had with people, irrespective of their religious background, that this will undoubtedly give it a boost."